Mukesh Ambani overtook Alibaba Group founder Jack Ma to become Asia’s richest person as he positions Reliance Industries to disrupt the e-commerce space. 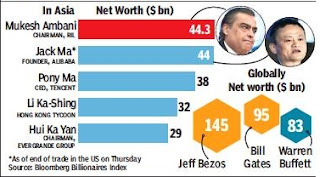 The chairman of the country’s refining-to-telecom conglomerate, Ambani, was estimated to be worth $44.3 billion on Friday with Reliance Industries rising 1.6% to a record Rs.1,100, according to Bloomberg Billionaires Index. Ma’s wealth stood at $44 billion at close of trade on Thursday in the US, where the company is listed. Later on Friday, Ma had regained his lead. Ambani has added $4 billion to his fortune this year as Reliance doubled its petrochemicals capacity and investors cheered the success of his disruptive telecom upstart Reliance Jio Infocomm. Then earlier this month, the tycoon unveiled plans to leverage his 215 million telecom subscribers to expand his e-commerce offerings, taking on the likes of Amazon and Walmart. Alibaba Group’s Ma has lost $1.4 billion in 2018. “We need to broaden our horizon of expectation with Reliance,” said Nitin Tiwari, a Mumbai-based analyst at Antique Stock Broking. “They are in for something really transformational.” Ambani, best known for executing large-scale projects, spearheaded construction of the world’s largest refining complex in Jamnagar, owns the most-widespread mobile data network globally and claims to have India’s biggest as well as most-profitable retail firm.